All aboard winding up and down through cultures past and present the sacred Valley/Cusco and enjoy the inca vestiges of Machu Picchu on this 2 day privately guided tour.The track slowly climbs it´s way out of Cusco passing through small ethnic communities over the high plains. The scenery is a masterpiece spectacular to the eye, with nature at it´s purest exposing views of eternal mountains, snow peaks ready to fall upon the avalanche of the Andes. Visit two of the most interesting and unique inca archaelogical sites in Peru The”Green Houses” of the Incas in Moray an impressive deep amphitheater like terrace swirling around in agricultural beauty and the Salt Mine Maras, watch the salt streams naturally evaporate as they bask in the sunshine to be harvested by the local farmers as they have done for centuries. Visit the wildest parts of your imagination and it resembles the abandoned ruins of Machu Picchu discovered in 1911.. A distallation of the oldest traditions and finest building on our planet. Day 1: Cusco – Moray – Salt Mine – Ollantaytambo – Aguas Calientes. Bus return to Aguas Calientes and afternoon Expedition train at 4:22pm to Ollantaytambo or Poroy and transfer by our private van to your hotel in Cusco arriving around 8 pm. We pick you up at your hotel in Cusco or the Sacred Valley and then we drive in our private van to the stunning Inca site of Moray also known as “The Greenhouses of the Incas” which is unique and fascinating. 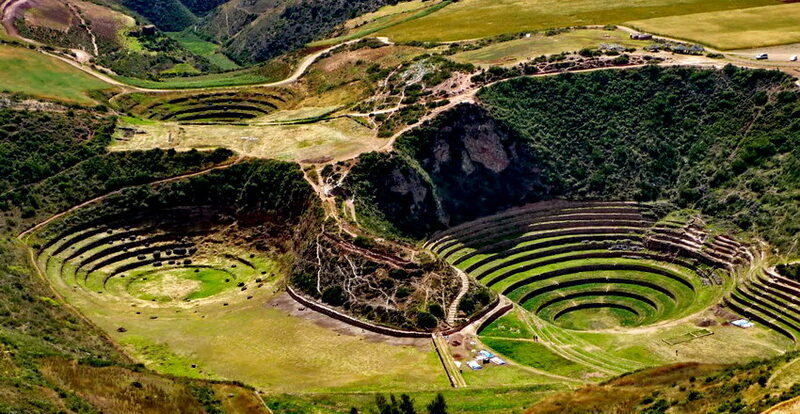 Different levels of terraces are carved into a huge bowl, part of which was further excavated by the Incas. The terraces have varied microclimates depending on how deep into the bowl they are and so they were thought to have been used by the Incas to discover the optimal conditions for their crops. After time to enjoy and explore this beautiful Inca sight, we continue driving towards the colonial town of Maras and to the Pre-Inca Salt Mine (Salineras). 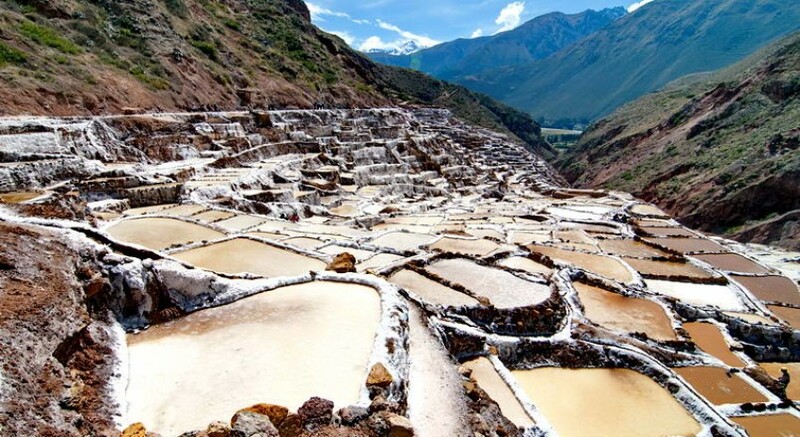 Thousands of salt pans have been used for salt extraction since before Inca times. A hot spring at the top of the valley discharges a small stream of heavily salt laden water, which is diverted into salt pans and evaporated to produce a salt that is used for cattle licks. Afterwards we continue our journey to Ollantaytambo, where we will explore the Inca remains and of course our guide will share with you the history of the amazing Inca city. Then we will take our train to Aguas Calientes, where we spend the night in a hotel. Upon arrival in Aguas Calientes a representative of the hotel will meet you and transfer to the hotel. you will take the bus up to Machu Picchu! You can decide the departure time with your guide. He will take you on a fascinating guided tour in the remains, lasting approximately 2 hours, then you will have plenty of free time for further exploring, taking photos and the option to climb Huayna Picchu or go up to the Sun Gate. Then back to Aguas Calientes and at approximately 4.22pm you will take your return train to Ollantaytambo or Poroy (Cusco) with a bus connection to Cusco, arriving at your hotel in the evening. Train ride to Aguas Calientes. Free afternoon to visit the hot springs or the flower garden. English speaking tour guide of the citadel. Return train ticket to Ollantaytambo then by bus to Cusco and to your hotel. 18 to 25 years old: US$30 Information required on student card: name of university, student name, photo of student, expiration date etc. A copy of the card at booking is required & government approval for discount. 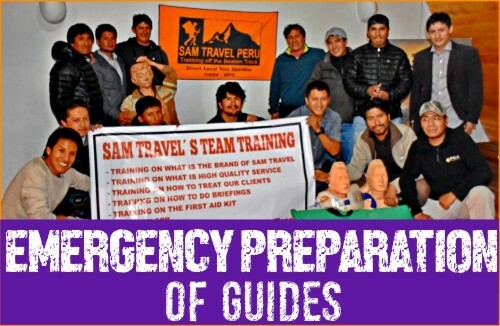 WHY YOU SHOULD TOUR WITH SAM TRAVEL PERU? SAM (initials of Saul Alvarez Montalvo) Travel Peru is a family owned travel agency and direct local tour operator based in Cusco with personal experience over many years of trekking. We are a “1000% Cusquenian Company” … SAM is a real Cusquenian Company without any shareholders. My dream was to create small personalised tours & treks strictly and only operated by local professional staff catering in high quality service and constant growth for our clients. I am very proud of my guides! Highly professional, speaking in fluent English and very knowledgeable. Passionate for the Inca heritage/ history, dedicated to a steady personal development and learning to ensure that you receive accurate and recognised theories about the Inca Andean culture. Fun loving, great sportsmen and well educated crew, some having a degree in Archaeology, Botany, History or Anthropology. Great entertainers and the best “Salsa Dancers” on this side of Machu Picchu. We use comfortable and fully licensed taxis, vans or buses which are used only by our clients and of course our drivers are very professional and cautious. You will be greeted on your arrival at Cusco airport and taken to your hotel; please ensure that you communicate your full flight arrival details at least 14 days prior to trip start. Look out for our representative holding an orange board of SAM Travel Peru at the arrival terminal. It can be done on any date that is best for you! 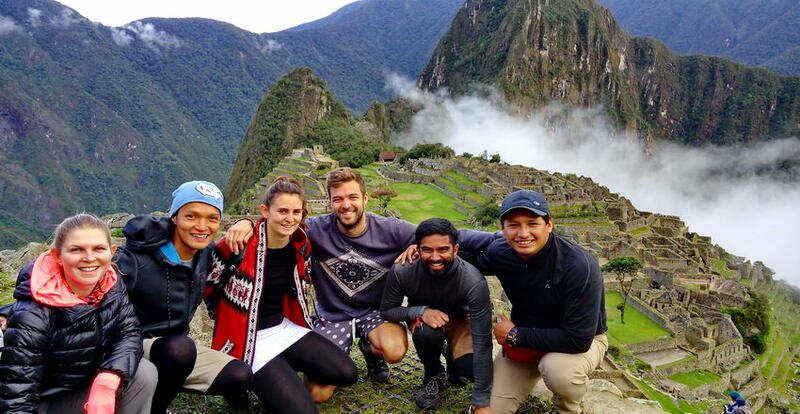 WHY THE 2 DAY TOUR TO MACHU PICCHU IS BETTER WITH SAM TRAVEL THAN WITH OTHERS? Because you will get a 2 hour guided private tour of Machu Picchu and then plenty of time for exploring further the citadel, eventually climbing the Wayna Picchu or going up to the Sun Gate. It will take place the night before the trekking departure at 6pm at our office which is located in Calle Santa Teresa Nº383 ; 303 (second floor). WHICH HOTEL IS INCLUDED AT AGUAS CALIENTES? MAY I HIKE UP TO HUAYNA PICCHU MOUNTAIN? SAM Travel Peru is an official licensed Travel Agency & Direct Local tour operator based in Cusco, it can be founded on the official government website: www.machupicchu.gob.pe Our office is located only a block away from the main plaza which is open Monday to Friday 9am til 8pm and Saturday 9am til 2pm. Small Groups from 2 – 8 people (could be 2, 4, 5…), a small group will make your experience different with personalised attention from the whole team, where you can also enjoy the route according to its rate hike. NOTE: A big group can be organised by request. ALL DEPARTURES ARE 100% GUARANTED – If you are booked, you are going! HOW DO I BOOK MY TOUR MACHU PICCHU? Please fill in the form from our “BOOK NOW” menu on our homepage. Then make a deposit of US$200 per person which you can do via PayPal to samtravelperu@gmail.com. Pay Pal does charge a small fee of 5.5% which has to be paid by the client. This comes to a total of US$211 per person including PayPal fees. As soon as we receive both we will book your Machu Picchu entrance tickets and train tickets. Then email you with a confirmation and your final invoice which can be paid when you arrive in Cusco. Unfortunately the answer is “No”. Once the tickets have been bought the government does not allow any changes, so we can’t change any departure dates. Tickets are also not transferrable nor refundable. *** If you cancel your Tour, the deposit is not refundable at all! WHAT TIME DOES THE TRAIN LEAVE ON THE WAY BACK TO CUSCO? It will depend on the train´s availability BUT the idea is to allow as much time as possible in Machu Picchu and enjoy the amazing views on the way back to Cusco from the train, you will take the train at 4:22pm. With this train schedule, you will have more than 9 hours for Machu Picchu and take the train during the daylight enjoying the scenic train ride. DO I NEED MY PASSPORT FOR MACHU PICCHU TOUR? OF COURSE! You have to bring your original passport and it is very important that it be the same passport number you sent to us. 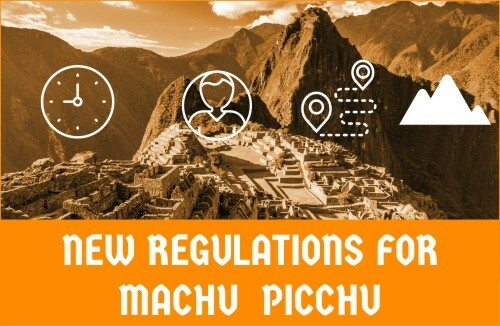 The rangers will check at Machu Picchu entrance and Huayna Picchu Mt entrance. The train company will also check your passport before allowing you to board the train. In case you are renewing your passport, go ahead and send us your old number to secure your permit, and we can change it when you get your new passport number…if so, please send the the new passport number as son as you get it. The weather is very unpredictable and its difficult to know BUT you will have many different season´s as you pass through the numerous microclimates and will depend on the location. We highly recommend to bring your warm clothes and good rain gear on your day back pack. If you’re happy with the services provided a tip – though not compulsory – is appropriate. While it may not be customary to you, it’s of great significance to the people who will take care of you during your travels. It inspires excellent service, and is an entrenched feature of the tourism industry across many SAM Travel Peru destinations. Of course you are free to tip more or less as you see fit, depending on your perception of service quality and the length of your trip. Remember, a tip is not compulsory and should only be given when you receive excellent service. Yes, We are a local sustainable & responsible tourism operator for that we incorporate the universal principle of tourism: protect the environment and benefit the local communities respecting their culture and religion. With this in mind we have trained our staff to know, understand and respect the place and the local people. ARE WE GOING TO BE DROPPED AT OUR HOTEL AFTER THE TOUR? Absolutely!!! On day 1st we will pick you up from your hotel and on last day we will drop you at your hotel! If you have booked your hotel in the Sacred Valley like Ollantaytambo or Urubamba, we may drop you over there too! FOR HOW LONG IS THE WAY BACK FROM AGUAS CALIENTES TO CUSCO? It is 2 hours by train from Aguas Calientes to Ollantaytambo and then another 2 hours from Ollantaytambo to Cusco by bus. If you upgrade to Vistadome all the way back to Poroy (Cusco), the train is 3.5 hours to Poroy, then 25mins by taxi to Cusco. Usually our clients are back at the hotel by 8.00pm, if you are planning to take the bus to Puno on the same night, that is totally possible. Please pay in cash at our office (US dollars or Peruvian soles) here in Cusco we have have many ATMs and BANK to withdraw money BUT you can pay by VISA and PAYPAL. We are required to charge an additional 5% since your card is international.